Author: George Olusola Ajibade. Series edited by: Wilhelm J.G. Möhlig. 16 pp. Roman, 248 pp. While the Yoruba people of South-western Nigeria have enjoyed both literary and ethnographic sympathy among many scholars, interests in the study of Yoruba orature explaining the people’s perception, beliefs, attitudes and practices related to Yoruba socio-cultural system remain uncommon. Thus, as George Olusola Ajibade espoused through a multi-lateral study of the people, enriched by descriptive ethnography and appropriate theory, a new dawn has emerged in the study of Yoruba orature. Within the context of rich ethnography, the author shows a perfect mastery of a popular form of Yoruba oral poetry that is well translated, thus providing a thick description of nuptial poetry of the Yoruba people. Projecting the Yoruba nuptial poetry as cultural heritage and social capital, the part played by this important aspect of Yoruba culture in the construction of gender relation and feminine identity becomes very clear. As against some beliefs that Yoruba society was a genderless one, using nuptial poetry as a form of orature, as argued by Ajibade in this book, the place of women in gender and power relations is confirmed beyond a reasonable doubt. 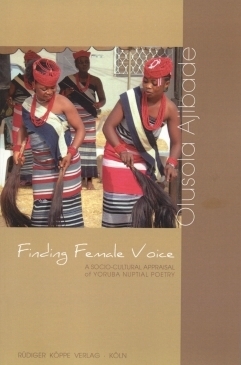 As the book projected an exemplary character of Yoruba women in voicing out their feelings for marriage, Ajibade makes a sound critique and elucidating arguments on how Yoruba women often regarded as ‘Voiceless’ use their voices in oral poetry to establish their domineering nature in Yoruba socio-political space. Thus, the author establishes that Yoruba women often act behind the veil to create gender influence in both private and public spheres. The book itself is a valuable contribution to the frontiers of knowledge. It is therefore a necessary collection to all private and public libraries and an invaluable academic resource for students, scholars and researchers at all levels as the book cuts across many disciplines such as linguistics, literature, history, anthropology, performing arts and religious studies among others.